Grasshoppers are moving in Arizona right now. 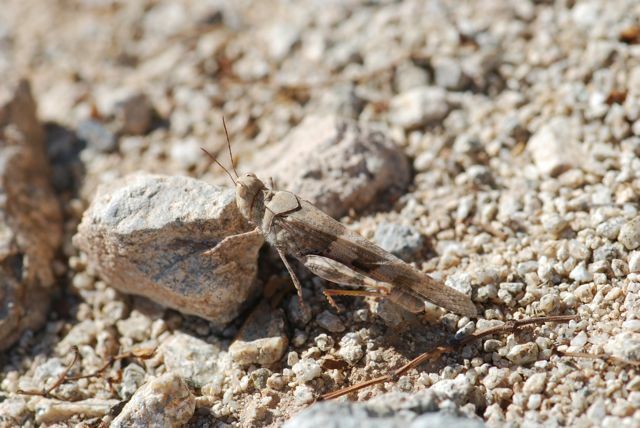 One of the most common species is the native pallid-winged grasshopper, Trimerotropis pallidipennis. It can be difficult to identify grasshoppers because members of a single species vary a lot in color. The two grasshoppers in the photographs are within a few feet of each other, but notice how much darker the top one's wing bands are (it isn't just the lighting). Grasshoppers often blend into the background so well that you don't see them until they jump and fly. 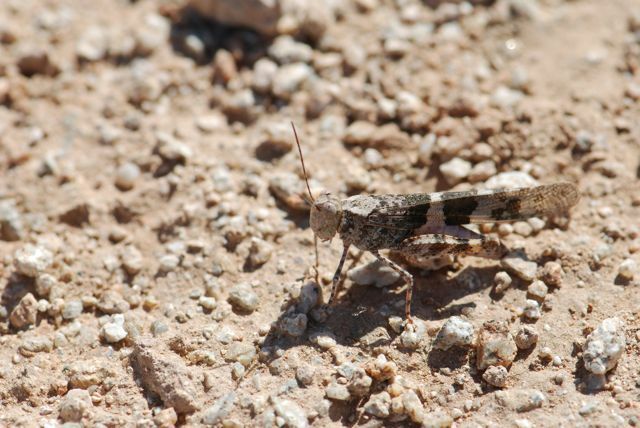 Pallid grasshoppers feed on desert grasses and when the grasses dry up, they move or "disperse" to areas with more food. According to this article, pallid grasshoppers have been found flying at altitudes of 3000-5000 feet for long distances. In one record in 1966 pallid grasshoppers from the western United States were found in Hawaii. That's a long flight! Are grasshoppers still active where you live? What colors do you see?